The Incredible review units have been arriving to some of the big sites in the past week, and the embargo is now off. Here I've assembled a collection of the best available review posts and videos, so that you can get the full Incredible experience before committing to a pre-order. The general consensus is: it's an amazing device, better than anything available in the US right now (Motorola Droid, Nexus One, etc) and yes, you should go get it. And yes, we should stop calling it incredible (as an adjective) in every review, but no, everyone will be still doing it. Joshua Topolsky and his strange clay looking hands claws review the Incredible here. Let's just put this out there: the Droid Incredible is the best Android device that you can purchase in America right now. It's better than the Droid, better than the Nexus One, and certainly beats the pants off of any previous generation handsets like the Eris, myTouch, or Cliq. It's not just a very, very good Android phone (though it is); it's also an excellent smartphone no matter how you cut it. If you're on Verizon right now, you're finally getting really great options for phones, but the Incredible is currently sitting at the top of that heap with a good bit of distance to the next in line. Sure, there are still issues like a lack of quality titles in the Android Market, and if a hardware keyboard is a must, this won't do the job for you. Also, while Sense is truly great on this phone, there may be users who prefer a more streamlined, stripped down experience. Still, if you're looking for an ultra-fast, extremely capable smartphone that has the guts and gleam to go the distance, the Incredible just might be the Droid you're looking for. Yes, we made that joke. Matt Buchanan chimes in with his review. The calculus is relatively simple: If you're on Verizon and want a smartphone (and aren't stuck with BlackBerrys), the Incredible is pretty much the one you should buy. With Palm's future unclear, and its app ecosystem shaky, it's hard to recommend the Pre, even though its software is generally more usable than Android. And the Droid's single redeeming feature over this, a physical keyboard, is actually less usable than the custom keyboard HTC's put on the Incredible. The Nexus One for Verizon looms, but the only reasons it could be considered superior—it feels better built and more expensive, and the promise of timely updates from Google—are mitigated by the fact the Incredible is here now, and HTC's Sense does glossy up some of Android's rough spots. 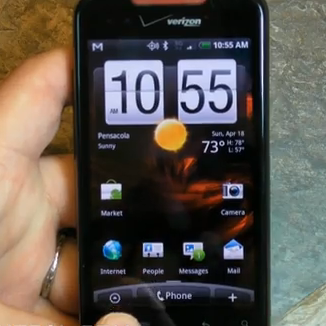 My little HTC Hero is sobbing in the corner - the Incredible is just… well… incredible.